Computer Works can acquire the hardware needed to assist your company in it's growth. With the power of our team of talented people, We are able to provide customers with high quality, relevant technology. The total business and home solution. Computer Works is an authorized Dell reseller, we are your local source for all your computer needs. 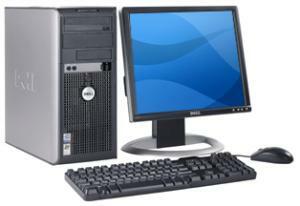 Call us today for a quote on a Dell computer and experience our competitive pricing. With personal installation and local support, we take the worry out of your next purchase. When you buy a Dell from us we provide a local warranty. Dell is the world's leading computer systems company. Dell designs, builds and customizes products and services to satisfy a wide range of customer needs. Dell offers quality, choice and value to business and home users. We can usually beat Dell's online price for OptiPlex, Latitude and PowerEdge products! Sometimes the latest and greatest hardware is not needed or wanted by a customer. That's why we offer used computers and accessories. Every piece of used equipment sold by Computer Works has been completely refurbished by our technicians. We guarantee every item that we refurbish and sell.